Miami Stainless range of high quality AISI 316 marine grade and AISI 304 stainless steel Pulley Blocks are available with removable pin or fixed bracket and fixed pin and all sheaves are produced from nylon. Pulley Block 25mm with Removable Pin AISI 304 Miami Stainless high quality AISI 304 grade ProRig.. 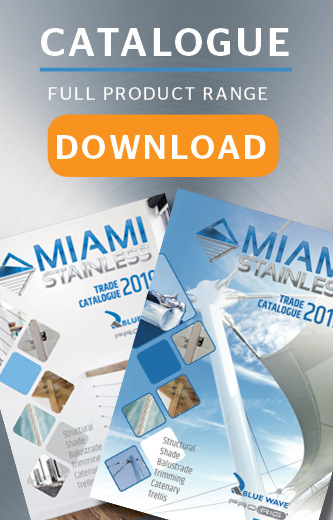 Pulley Block 25mm Single with Bracket and Removable Pin AISI 316 Miami Stainless range of high q.. Pulley Block 25mm Double with Bracket and Removable Pin AISI 316 Miami Stainless range of high qu.. Single Pulley Block 25mm Fixed AISI 316 Miami Stainless 25mm Fixed Pulley Block is high quality .. Double Pulley Block 25mm Fixed AISI 316 Miami Stainless range of high quality ProRig AISI 316 ma.. Pulley for Continuous Wire suits 2.5mm Wire Fixed AISI 304 Miami Stainless high quality AISI 304..